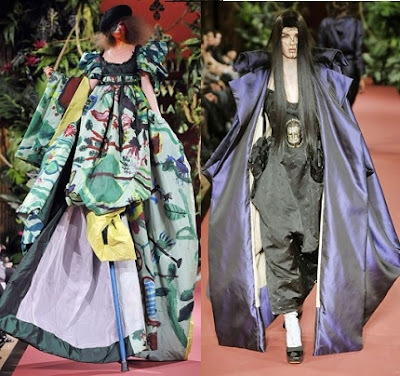 Always outrageous and pushing the limits in the fashion world, fashion designer Vivienne Westwood unveiled her autumn-winter ready to wear show in Paris this past Monday with Eco inspired painting throughout the collection. Beyond the innovative theme was work of a team of truly "fresh thinkers" - seven and eight year old primary school student from a school in Nottingham U.K. The designer received photos from the students after submitting a brief to the class asking the student to imagine soldiers who had been fighting in the jungle and when the war was over, they had so fallen in love with nature that they did not want to go back to the city. The designer was so impressed with the results that she enlisted the team of creative kids as collaborators in an "Eco-Warrior" themed collection called "Chaos Point." Here is a sneak peak of the show, courtesy of AP.